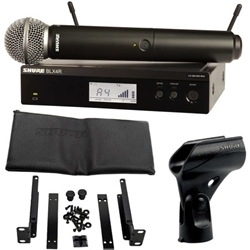 This package includes the Shure BLX4R rackmountable receiver and a handheld mic transmitter with a Shure SM58 microphone capsule. The SM58 is a cardioid dynamic microphone for vocals. The BLX4R is a half-rack sized wireless receiver built into a rugged chassis that mounts into any standard 19" road rack. It features advanced capabilities usually unavailable in wireless systems in this price range.